TO ADVERTISE YOUR STALLION AT STUD PLEASE INCLUDE YOUR STALLIONS APPA REGISTRATION NUMBER, STATE , YOUR CONTACT NUMBER, 1 PHOTO ONLY , AND ANY SPECIAL ACHIEVEMENTS YOU WISH MENTIONED. Please send via POST if your wanting to place an add.. This delightfull old gentleman will give you a wonderfull coloured foal. He has a divine temperament, and so very gentle with his mares. He will be at limited Stud. For the 2018 Season $400.00 Service Fee Plus $5.00 a day board. Alex has a beautiful conformation and a temperament to match. A full book this season. Supreme Exhibit Adelaide palouse pony state show 2015. Tya is standing at Davilair palouse pony stud VIC, Kingston will be available to a selected number of mares. Service Fee $500 - $10 Agistment Fee or by other arrangement. 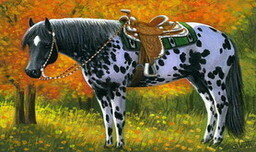 10.1hh Leopard Palouse Stallion , Reg APPA & B&CPPA. Fred has won numerous awards with the last win at the 32nd APPA National Show to take out Grand Champion Palouse Stallion 10hh n/e 14hh and Supreme of show 10hh n/e 14hh. At present we arent taking any bookings due to property doesnt have efficient facilities for outside mares at this stage. Goldy is a 38" Palouse Pony Stallion , registered APPA & B&CPPA. 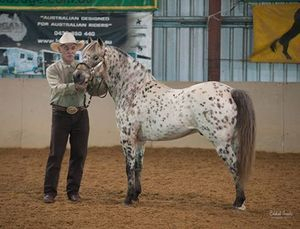 Goldy hasnt been in the showring in well over 10 yrs to make a comeback in at the 32nd APPA National Show to win Champion Coloured Palouse Stallion under 10hh .